just like to thank djlandofcastles ltd for the slide castle you done for us on sat 9th feb 2013.it came on time plus you did a full risk assessment with me.the kids love it.thanks again will be booking again soon.paula jones. grease themed bouncy castle hire. 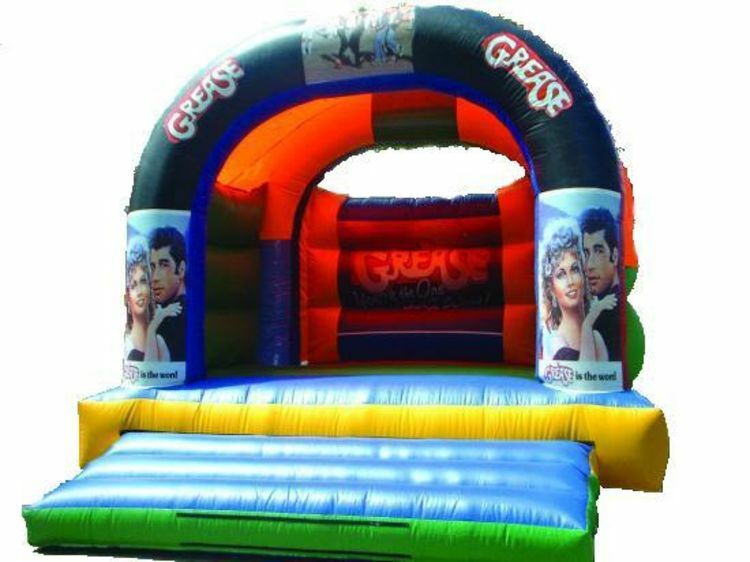 Our 15ftx15ft grease themed bouncy castle features all the grease movie characters,if you loved the grease movie this castle is ideal for you,it is very popular with children. This themed bouncy castles has a raincover so whatever the weather you can still have fun on our Grease themed bouncy castle.The required space you will need is 17ft x 17ft,the height of this bouncy castle is 12ft.If the bouncy castle is going indoors,please ensure the celing height of the venue where the bouncy castle is going is higher than the bouncy castles height.We deliver our themed bouncy castles, inflatable slides,rodeo bull hire,plus are assault courses and adult bouncy castles and domes,to Merseyside & Liverpool, Widnes, Runcorn, Wirral,Warrington, and St Helens, and some of these areas and further areas will be a additional fuel charge or toll/tunnel charge.Check our delivery checker on our home page,it will tell you if there is a charge for your area.